I've bought a greek tortoise 5 months ago, the pet shop told me that it is from Europe, but didn't know it's age... Is there a way to know the ago of it? It is small size, since I bought it, it's shell grew few millimeters. I appreciate your help. Hi i have a spur-thighed tortoise, bought him two years ago as a baby - he is already nearly 7 " long - have i overfed him?! 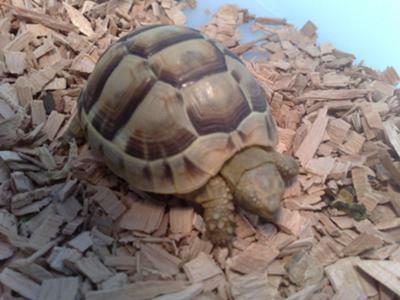 I have a greek tortois but looking at your tortoise i would say about 1 year old. If you are not around when your tortoise hatches, the only way to tell its age is by the size of its shell. A Greek tortoise will be about 1-1/2 inches long when it hatches, and will grow to be about 7 inches long. It will reach about 3 inches in approximately two years if it is healthy. Once a tortoise is full grown, there is not reliable way to tell its true age.